The GW-7243D is one of DeviceNet products in ICP DAS and it stands as a DeviceNet slave to Modbus TCP/RTU/ASCII master Gateway device. It allows a master located on a DeviceNet network to enter a dialogue with slave devices on the Modbus TCP/RTU/ASCII network. In DeviceNet network, it functions as a Group 2 Only Server device. In Modbus network, GW-7243D represents a master device and sends request message to access the Modbus TCP/RTU/ASCII slave device by DeviceNet object definition. In order to simplify the protocol converting mechanism, we also provide the GW-7243D Utility tool for users to configure the device parameters and build EDS file for the DeviceNet slave device. Users can easily apply Modbus TCP/RTU/ASCII devices in DeviceNet applications through the GW-7243D. The application architecture is depicted as following figure. 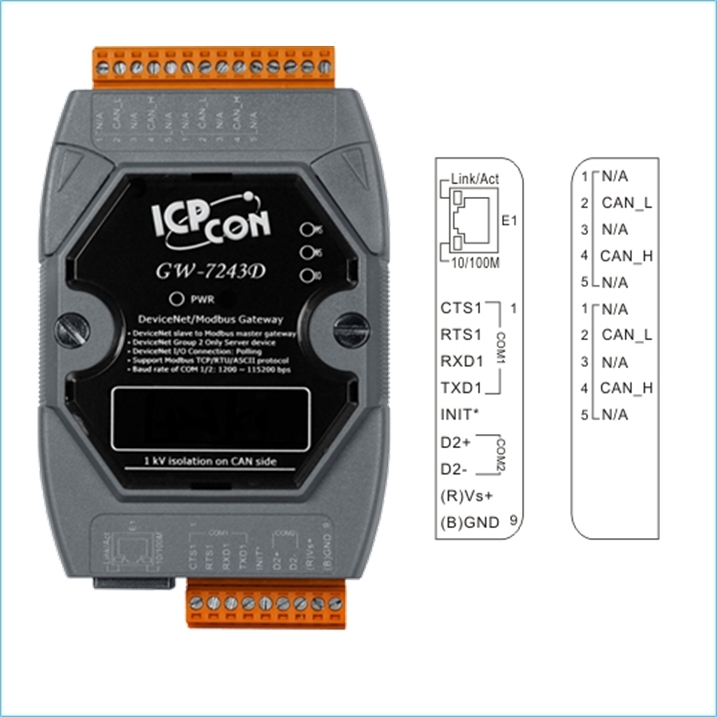 Users can connect the Modbus TCP/RTU/ASCII devices to the DeviceNet network via the GW-7243D. Maximum support 2048 channels DI，2048 channels DO，1024 channels AI and 1024 channels AO for each COM port. Maximum support 2048 channels DI，2048 channels DO，1024 channels AI and 1024 channels AO for each Modbus TCP device.